When the body of a Bushman is discovered near the Central Kalahari Game Reserve, the death is written off as an accident. But all is not as it seems. An autopsy reveals that, although he's clearly very old, his internal organs are puzzlingly young. What's more, an old bullet is lodged in one of his muscles... but where is the entry wound? 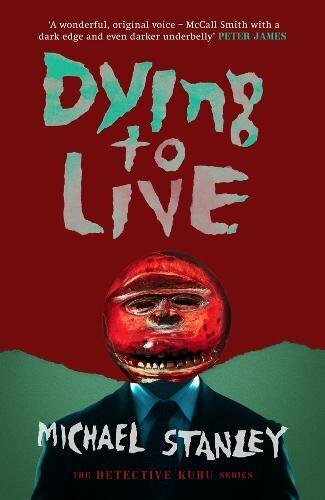 When the body is stolen from the morgue and a local witch doctor is reported missing, Detective 'Kubu' Bengu gets involved. But did the witch doctor take the body to use as part of a ritual? Or was it the American anthropologist who'd befriended the old Bushman? As Kubu and his brilliant young colleague, Detective Samantha Khama, follow the twisting trail through a confusion of rhino-horn smugglers, foreign gangsters and drugs manufacturers, the wider and more dangerous the case seems to grow. There's a wonderful dichotomy in this fascinating Botswana-set series: Detective 'Kubu' Bengu is a portly hero, a good detective who can veer towards comical moments at times. There's plenty of humour salted in, but the events and underlying issues in the books delve into some very dark places. Co-writers 'Michael' Sears and 'Stanley' Trollip, a pair of retired university professors, strike a great balance between light and dark. They do a fine job sprinkling in some laughs while addressing serious and often nasty issues - some specific to the African setting, and others more universal. They also tread the line really well in terms of exposing readers to a variety of themes and issues without hopping on a soapbox or becoming polemic. Coupled with a great narrative drive that makes DYING TO LIVE a really good read with layers of setting and theme adding to the mystery storyline, giving it more depth and texture rather than slowing or overwhelming it as can happen elsewhere. In this sixth instalment, Kubu ("Hippo" - an appropriate nickname given his manner and build - seemingly slow and serene but deadly when roused) is distracted from his police work because his little adopted daughter Nono is very ill. As the Bengu family search for answers, tensions rise and beliefs are put to the test. Kubu has to rely even more on his team as they investigate the strange death of the old-yet-young Bushman, the subsequent theft of the body, and the disappearance of a local witch doctor. Kubu puts Detective Khama on the latter case, testing whether she can overcome her ingrained hatred of witch doctors to find justice for anyone. As Michael Connelly's Harry Bosch would say, "Everybody counts or nobody counts". Like Connelly's masterful series, Michael Stanley's books are well-balanced and very good across the board - intriguing mystery storylines, engaging and interesting characters, and a vividly evoked setting that transports readers to the scene - all entwined with thought-provoking real-life issues. The authors give readers a wonderful taste of Botswana - the good and the bad. The integration of cuisine, language, history, and cultural issues unique to the locale adds great flavour. In each book I learn more about the country, and in DYING TO LIVE challenging topics like AIDS and biopiracy are addressed, along with muti (traditional medicine, delivered by witch doctors) and poaching. There's plenty here for both long-time Kubu fans and new readers. (You don't need to have read the previous books to thoroughly enjoy this one). A great instalment in a highly engaging series.